- lots of lightweight canvas pencil wraps! I'm a closet ‘everything but the kitchen sink' artist - or at least I was until I started showing people what I take on my travels on the internet! 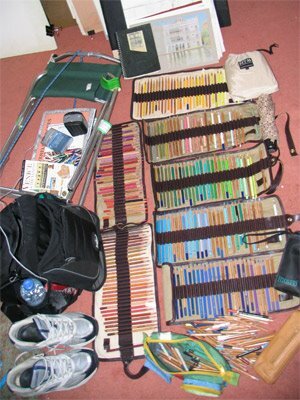 This is my travel kit for artwork abroad – all of this goes in the luggage and on the plane! And when I'm being very ambitious or going on a long trip my pastels go to! At the moment I'm in the middle of sorting out what I'm packing for my next big trip to California, Arizona and New Mexico. I pack the art stuff first and then weigh and see how much I've got left for clothes. Priorities! Tonight I packed my pencil wraps with coloured pencils having visited the art shop earlier in the day to get new supplies of the Daler Rowney sketchbook I use on every trip. I'll also be taking a new Moleskine. However, you don't have to take all of this. Each individual has their own individual perspective on what they need. All are equally valid - it's whatever it takes to make you feel you can do good work. Mind you, my opinions have been honed through much travel and carrying supplies around. My on-board luggage tends to contain the expensive art supplies, a change of underwear and a clean Tshirt! Small light electric sharpener (for sharpening points in the evening. Good footwear for all that walking! Sack with lots of pockets enabling easy location of different bits of art gear. I now use a backpack. Last year in Venice I found that a shopping trolley on wheels was the best way to get stuff around in terms of making oneself visible in the narrow allies in Venice. The airline didn't bat an eye when it got loaded on to the plane for the return journey! Wow! Your back, shoulders, and arms must be very strong. Just the small backpack I took on the sketchcrawl caused my shoulders and back lots of pain. And I too am one to take all but the kitchen sink. I will look forward to your journeys as I have not travelled. This will give me an opportunity to see "the world" without leaving my house. I look forward to each new post. Great to share your experiences. I am looking at how artists travel on long tours and came across interesting stuff about Turner's equipment on Tate's site. Be fantastic if we could exchange information about web links for artists travels, fascinating subject. I found some other Turner travel bits from the Tate web site. This is for his english tours.